Background: Arrhythmia and sudden cardiac decompensation (acute myocardial infarct or acute heart failure) are the most often causes of out-of-hospital cardiac arrest (OHCA). Emergency cardiac catheterization followed by coronary revascularization (percutaneous coronary intervention [PCI] or coronary artery bypass grafting surgery [CABG]) or valvular surgery is a lifesaving procedure. However, the result of this emergency room resuscitated OHCA patients underwent cardiac invasive procedure was not well defined before. Materials and Methods: One hundred and seventy (including 23 traumatic and stroke, etc.,) out of 705 OHCA patients were resuscitated and achieved a return of spontaneous circulation (ROSC) at Emergency Room of Chung Shan Medical University Hospital from January 1, 2011, to March 31, 2015. Only 23 (M/F = 25/8) out of 147 medically resuscitated OHCA patient with one or more cardiac risk factors were transferred for emergency cardiac catheterization (33/147). Thirty-one of them (31/33) underwent PCI (either balloon angioplasty or stent deployment) with coronary culprit stenotic lesions (>70%) of right coronary artery (15), left anterior descending artery (12), circumflex branch of left coronary artery (5), and left main coronary artery (1). One of the rest two patients with aortic valvular stenosis who underwent aortic valve replacement; and another with triple vessel disease of coronary artery received CABG. Results: All 33 patients (22.4%) survived the catheterization procedures and were sent to intensive care units. 31 patients were in comatose state and 24 eventually deceased due to cardiogenic shock (16), septic shock (4), ventricular tachycardia and ventricular fibrillation (2), hyperkalemia (1) and multiple organ failure (1). Nine patients (27.3%) survived to hospital discharge and were followed up at OPD periodically (1.3–43 months, mean 30.4 months). Four OHCA patients required extra-corporeal membrane oxygenation support, but only one out of four underwent PCI and survived. Conclusions: The resuscitated OHCA (ROSC) patients with any cardiac disease in the past should undergo emergency cardiac catheterization and possible intervention procedure with an acceptable result (survival to hospital discharge rate of 27.3%). Sudden cardiac arrest is a major cause of unexpected death, as well as a major clinical issue., The survival rate after out-of-hospital cardiac arrest (OHCA) is estimated to be below 5% from most reports throughout the world. The procedures and strategies that may improve the outcomes of cardiac arrest patients include cardiopulmonary resuscitation (CPR), defibrillation, the use of automated external defibrillators, and therapeutic hypothermia.,,,,, However, the survival rate after OHCA continues to be poor even though treatments for coronary heart disease and the practice of CPR have been improving for decades. There are approximately 2.7 million inhabitants lived in Taichung area of Taiwan, which is served by a comprehensive centrally coordinated ambulance system. The Chung Shan Medical University Hospital is one of the large tertiary-care referral centers that provide 24-h emergency coronary and cardiac surgical interventions for patients with acute coronary syndromes (ACSs). ACS is one of the major causes of sudden death according to autopsies and coronary angiograms., Many clinical trials among ST-elevation myocardial infarction (STEMI) patients and selected patients with non-ST-elevation ACS demonstrated that early cardiac catheterization and coronary revascularization (percutaneous coronary intervention [PCI] or coronary artery bypass grafting surgery [CABG]) improved outcomes, and primary PCI is currently the standard care for patients with STEMI in general clinical settings. However, most patients who were included in the clinical trials mentioned above were not all cardiac arrest patients, and the meaning of revascularization for resuscitated patients remains unclear. Recent studies have reported that using emergency PCI to resuscitate patients has the potential to improve their outcomes., Stær-Jensen, et al. also reported that initial EKG findings are not reliable. Even in the absence of EKG changes indicating myocardial ischemia, an acute culprit lesion may be present and patients may benefit from emergent revascularization. The purpose of this one single-center experience is to elucidate the patients' characteristics in relating to the effects of emergent cardiac intervention among resuscitated patients in a large tertiary-care referral center. 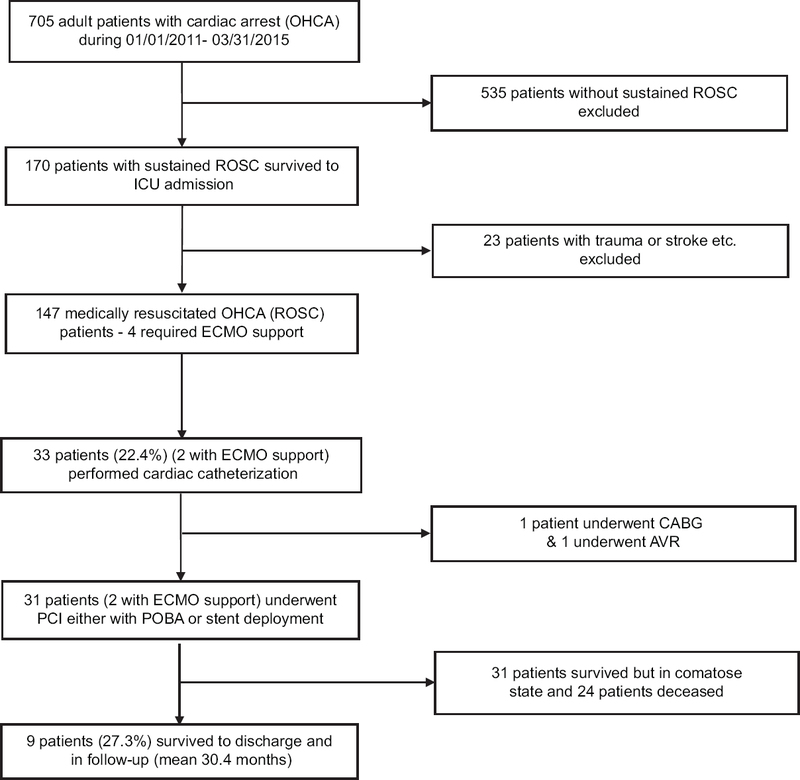 In this retrospective analysis, we evaluated clinical characteristics and outcomes of all patients who had an OHCA with sustained return of spontaneous circulation (ROSC) at Chung Shan Medical University Hospital from January 1, 2011, to March 31, 2015. The study was performed in accordance with the Chung Shan Medical University Hospital Ethics Committee guidelines. The primary outcome was survival to hospital discharge. Interrogation of the hospital database identified 705 patients with presumed OHCA. Among them, 170 patients were successfully resuscitated. Twenty-three patients were excluded secondary to noncardiac causes such as trauma, stroke, cancer, and drug overdose. The study population, therefore, consisted of 147 medically resuscitated OHCA patients. In this period, the decision regarding the need for cardiac catheterization was made according to patients with history of the risk factors of coronary artery disease (CAD) or electrocardiogram showing ST-T change after resuscitation [Table 1]. Intensive care including target hemodynamic and metabolic parameters and even choice of inotropic agents or support of extracorporeal membrane oxygenation (ECMO) were decided according to general critical care study cohort [Figure 1]. One hundred and seventy patients out of 705 resuscitated OHCA patients (24.1%) were successfully resuscitated and achieved ROSC at the emergency department of Chung Shan Medical University Hospital. There were only 33 nontraumatic medically resuscitated patients (33/147 = 22.4%). Among them, 25 were males and 8 were females with two or more cardiac risk factors were transferred for emergency cardiac catheterization. There were 31 patients in comatose state with Glasgow coma scale (GCS) E1M1VT and 2 patients in GCS E2M5VT immediately after the resuscitation. All 33 patients were referred for emergency cardiac catheterization. Thirty-two patients had culprit stenotic coronary artery lesion (>70%) at RCA (17), LAD (14), LCX (7), LM (1) coronary arteries, and 1 with insignificant lesions. There were 31 patients with CAD underwent PCI (either with plain old balloon angioplasty or stent deployment). None of them had documented contraindications to cardiac catheterization, nor did any patients or their surrogates refuse the procedure when it was offered. Moreover for the rest two patients, one with aortic valvular heart disease underwent aortic valve replacement and one with triple-vessels CAD was transferred for CABG. These two patients survived. The hospital stay for these 33 resuscitated patients was from 1 day to 57 days with a mean of 10.2 days. The Intensive Care Unit stay was from 1 day to 34 days with a mean of 7.8 days. Veno-arterial extracorporeal membrane oxygenation was applied to 4 patients with cardiogenic shock in association with ventricular tachycardia ventricular fibrillation arrhythmia after CPR. The duration of ECMO applied in those four patients was from 3 to 9 days with a mean of 6.3 days. Among them, only one was weaned from ECMO and was transferred to respiratory care ward. All 33 resuscitated patients underwent endotracheal intubation and in ventilator use. The duration of intubation period was from 1 day to 34 days with a mean of 8.2 days. While the duration of endotracheal intubation for 9 survived patients was from 5 days to 48 days (one with tracheostomy) with a mean of 13.3 days. Regarding about 12 patients with acute renal injuries, only 5 patients received continuous venovenous hemodialysis and two of them converted to regular hemodialysis. Among those, three patients receiving regular hemodialysis, one had had chronic kidney disease with regular hemodialysis before cardiac arrest. 24 out of 31 comatose patients (74%) eventually deceased because of a variety of reasons [Table 2]. As the rest two clear conscious patients (2/33; 6%) were transferred to respiratory care ward or further respiratory care and one survived. All these 31 patients received palliative and spiritual care program during their stay in the intensive care unit or respiratory care ward. Nine patients (9/33; 27.3%) survived to hospital discharge without any complications (including neurologic deficit, paralysis/paresia or renal impairment etc.,) and were followed up at our outpatient department periodically (1.3–43 months, mean 30.4 m) [Table 2]. There were several observational reports regarding PCI for cardiac arrest patients, and proved that PCI may improve the outcomes of resuscitated cardiac arrest patients. However, the OHCA patients' risk factors and the efficacy of emergency cardiac intervention for resuscitated cardiac arrest patients remain unclear.,,,,,,,,,, In our study, 33 patients with cardiac risk factor of all 147 ROCS patient received emergent catheterization had survival rate of 27.3% (9/33), which higher than average rate in the past reports. Our result indicated the value of emergent catheterization in resuscitated OHCA patient with cardiac risk factor. Stær-Jensen, et al. had reported that initial EKG findings are not reliable to identify if patient's cardiac arrest is secondary to ischemia event, which indicates the possibility of false negative. 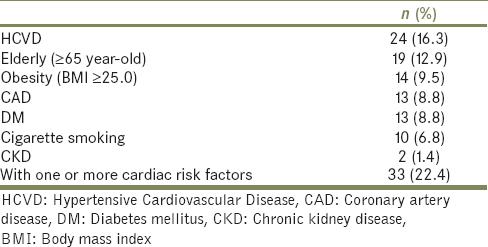 Therefore, we exclude EKG findings as our risk factors are listed in [Table 1]. However if ischemia findings appear in EKG, I believe that it should be an indicator to do PCI in resuscitated OHCA patient. Kagawa et al. reported that alternative CPR using venoarterial extracorporeal membrane oxygenation (ECMO) has the potential to improve the outcomes of cardiac arrest patients. Though his study is observational and has potential biases, the combination of ECMO, PCI, and therapeutic hypothermia could be one solution for refractory cardiac arrest patients.,, In our study, four of our OHCA patients required veno-arterial ECMO (ECMO V-A type) support. However, only two out of the four underwent PCI and one survived. PCI seems to have a better survival rate in ECMO group (50% vs. 0%). However, it is a retrospective study; and the case number is too small to prove it. Hypothermia therapy in OHCA patient had been reported and discussed well before.,, We can increase the survival rate by decreasing the consumption of heart by low temperature. However, the patency of coronary artery is still the priority to save the heart. In our study, we had no patient received hypothermia therapy, but we still had an acceptable result by doing PCI after resuscitated OHCA. If we combine these two therapies in the future, we believe the result could be better. Although 24 of 31 comatose patients were still deceased, basing on ethical and legal principles (Palliative Care and Spiritual Care Recommendation for End-of-Life Care) had been given to those comatose patients and their families to support them through the process of dying and bereavement period through an interdisciplinary approach. Our study demonstrates that emergency cardiac catheterization for resuscitated OHCA patients with two or more cardiac risk factors followed by coronary revascularization (PCI or CABG) or surgical procedure (aortic valve replacement) may improve the outcomes, and also support the combination usage of ECMO and PCI is a life-saving procedure for refractory cardiac arrest patients. However, our limitations are small case numbers in sub-categories and not introducing hypothermia therapy. Its our goal in the future. The resuscitated OHCA (ROSC) patients with history of the risk factors of CAD or electrocardiogram showing ST-T wave change after resuscitation should undergo emergency cardiac catheterization and possible intervention procedure associated with therapeutic hypothermia to achieve an acceptable result (survival to hospital discharge rate of 27.3%). SOS-KANTO study group. Cardiopulmonary resuscitation by bystanders with chest compression only (SOS-KANTO): An observational study. Lancet 2007;369:920-6. Kitamura T, Iwami T, Kawamura T, Nitta M, Nagao K, Nonogi H, et al. Nationwide improvements in survival from out-of-hospital cardiac arrest in Japan. Circulation 2012;126:2834-43. Marenco JP, Wang PJ, Link MS, Homoud MK, Estes NA 3rd. Improving survival from sudden cardiac arrest: The role of the automated external defibrillator. JAMA 2001;285:1193-200. Mottram AR, Page RL. Advances in resuscitation. Circulation 2012;126:991-1002. Lerner EB, Rea TD, Bobrow BJ, Acker JE 3rd, Berg RA, Brooks SC, et al. Emergency medical service dispatch cardiopulmonary resuscitation prearrival instructions to improve survival from out-of-hospital cardiac arrest: A scientific statement from the American Heart Association. Circulation 2012;125:648-55. Bernard SA, Gray TW, Buist MD, Jones BM, Silvester W, Gutteridge G, et al. Treatment of comatose survivors of out-of-hospital cardiac arrest with induced hypothermia. N Engl J Med 2002;346:557-63. Kagawa E, Inoue I, Kawagoe T, Ishihara M, Shimatani Y, Kurisu S, et al. Who benefits most from mild therapeutic hypothermia in coronary intervention era? A retrospective and propensity-matched study. Crit Care 2010;14:R155. Davies MJ, Thomas A. Thrombosis and acute coronary-artery lesions in sudden cardiac ischemic death. N Engl J Med 1984;310:1137-40. Spaulding CM, Joly LM, Rosenberg A, Monchi M, Weber SN, Dhainaut JF, et al. Immediate coronary angiography in survivors of out-of-hospital cardiac arrest. N Engl J Med 1997;336:1629-33. Vyas A, Chan PS, Cram P, Nallamothu BK, McNally B, Girotra S, et al. Early coronary angiography and survival after out-of-hospital cardiac arrest. Circ Cardiovasc Interv 2015;8. pii: e002321. Knafelj R, Radsel P, Ploj T, Noc M. Primary percutaneous coronary intervention and mild induced hypothermia in comatose survivors of ventricular fibrillation with ST-elevation acute myocardial infarction. Resuscitation 2007;74:227-34. Garot P, Lefevre T, Eltchaninoff H, Morice MC, Tamion F, Abry B, et al. Six-month outcome of emergency percutaneous coronary intervention in resuscitated patients after cardiac arrest complicating ST-elevation myocardial infarction. Circulation 2007;115:1354-62. Stær-Jensen H, Nakstad ER, Fossum E, Mangschau A, Eritsland J, Drægni T, et al. Post-resuscitation ECG for selection of patients for immediate coronary angiography in out-of-hospital cardiac arrest. Circ Cardiovasc Interv 2015;8. pii: e002784. Gräsner JT, Meybohm P, Caliebe A, Böttiger BW, Wnent J, Messelken M, et al. Postresuscitation care with mild therapeutic hypothermia and coronary intervention after out-of-hospital cardiopulmonary resuscitation: A prospective registry analysis. Crit Care 2011;15:R61. Cronier P, Vignon P, Bouferrache K, Aegerter P, Charron C, Templier F, et al. Impact of routine percutaneous coronary intervention after out-of-hospital cardiac arrest due to ventricular fibrillation. Crit Care 2011;15:R122. Siudak Z, Birkemeyer R, Dziewierz A, Rakowski T, Zmudka K, Dubiel JS, et al. Out-of-hospital cardiac arrest in patients treated with primary PCI for STEMI. Long-term follow up data from EUROTRANSFER registry. Resuscitation 2012;83:303-6. Nanjayya VB, Nayyar V. Immediate coronary angiogram in comatose survivors of out-of-hospital cardiac arrest – An Australian study. Resuscitation 2012;83:699-704. Dumas F, White L, Stubbs BA, Cariou A, Rea TD. Long-term prognosis following resuscitation from out of hospital cardiac arrest: Role of percutaneous coronary intervention and therapeutic hypothermia. J Am Coll Cardiol 2012;60:21-7. Maze R, Le May MR, Hibbert B, So DY, Froeschl M, Glover CA, et al. The impact of therapeutic hypothermia as adjunctive therapy in a regional primary PCI program. Resuscitation 2013;84:460-4. Zanuttini D, Armellini I, Nucifora G, Carchietti E, Trillò G, Spedicato L, et al. Impact of emergency coronary angiography on in-hospital outcome of unconscious survivors after out-of-hospital cardiac arrest. Am J Cardiol 2012;110:1723-8. Larsen JM, Ravkilde J. Acute coronary angiography in patients resuscitated from out-of-hospital cardiac arrest – A systematic review and meta-analysis. Resuscitation 2012;83:1427-33. Weiser C, Testori C, Sterz F, Schober A, Stöckl M, Stratil P, et al. The effect of percutaneous coronary intervention in patients suffering from ST-segment elevation myocardial infarction complicated by out-of-hospital cardiac arrest on 30 days survival. Resuscitation 2013;84:602-8. Kagawa E, Dote K, Kato M, Sasaki S, Nakano Y, Kajikawa M, et al. Should we emergently revascularize occluded coronaries for cardiac arrest? : Rapid-response extracorporeal membrane oxygenation and intra-arrest percutaneous coronary intervention. Circulation 2012;126:1605-13. Waldo SW, Armstrong EJ, Kulkarni A, Hoffmayer K, Kinlay S, Hsue P, et al. Comparison of clinical characteristics and outcomes of cardiac arrest survivors having versus not having coronary angiography. Am J Cardiol 2013;111:1253-8. Waldo SW, Chang L, Strom JB, O'Brien C, Pomerantsev E, Yeh RW, et al. Predicting the presence of an acute coronary lesion among patients resuscitated from cardiac arrest. Circ Cardiovasc Interv 2015;8. pii: e002198. Geri G, Dumas F, Bougouin W, Varenne O, Daviaud F, Pène F, et al. Immediate percutaneous coronary intervention is associated with improved short- and long-term survival after out-of-hospital cardiac arrest. Circ Cardiovasc Interv 2015;8. pii: e002303. Shin TG, Choi JH, Jo IJ, Sim MS, Song HG, Jeong YK, et al. Extracorporeal cardiopulmonary resuscitation in patients with inhospital cardiac arrest: A comparison with conventional cardiopulmonary resuscitation. Crit Care Med 2011;39:1-7. Truog RD, Campbell ML, Curtis JR, Haas CE, Luce JM, Rubenfeld GD, et al. Recommendations for end-of-life care in the Intensive Care Unit: A consensus statement by the American College [corrected] of Critical Care Medicine. Crit Care Med 2008;36:953-63.